Like asynchronous-multiplayer word games? Then Hanging With Friends [Free / $1.99] is the game for you. 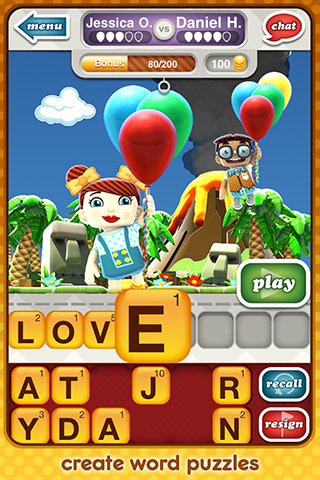 Brought to us by Zynga and the folks behind Words With Friends [Free / $2.99 / HD], Hanging With Friends is a strange-but-fun combination of Hangman and Scrabble. Like other asynchronous titles (and exactly like the other With Friends games), you start a game by finding someone to play with. You can find opponents randomly, or amongst Facebook friends or your contact list. You can also find a friend by their username or play locally with pass and play. Once you’ve found a friend to play with, you create a word using a random selection of letter tiles. You have a chance to earn bonus points by positioning your letters on double or triple letter/word score spaces. When your word is made, its your opponent’s turn to guess. Guessing is done in classic hangman style. 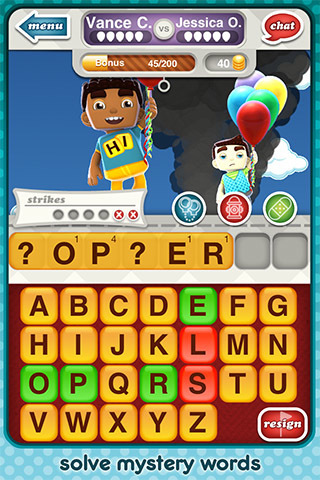 You have a set number of strikes based on the length of the word (shorter words are harder, so you get more chances with them), and you can pick from all the letters in the alphabet. Guess your opponent’s word before running out of strikes, and you live to play another day. Fail, and your cute little avatar loses a balloon and gets closer to falling into the pit of lava below. Avatar? Lava? Yeah, you’re not getting hanged in Hanging With Friends. This is a kinder, gentler, Zynga-er take on the game. When you first begin, you’re asked to create a boy or girl avatar, with a few customization options (I can almost smell the cash shop coming, though it’s not in yet). When you play, your avatar floats with balloons above almost certain death. Animations let you watch your opponent (or yourself) squirm as failure draws near. But this is a family game, so you’ll never see the fatal fall. You and your opponent each take turns creating words and guessing at them until one of you runs out of balloons. To keep things interesting, you’re both given a set of lifelines that you can use to save yourself. The extinguisher removes options from the board, revive gives you back a strike, and suspects gives you a one-in-four chance of getting the right letter. They’re free the first time you use them against a given opponent, and after that they cost 20 coins. It looks like you’ll be able to buy coins with an in-app purchase in the future, but for now you earn them with with bonus points or high-scoring words. It’s a nice little addition to the formula. My only reservations are the usual complaints about the With Friends games. The game feels slower than it should. Each time you open the app you have to wait for your games to update, and then you have wait to load your game. The new mechanics slow things down even further, letting you sit through an animated retelling of your opponent’s turn and making you go through a few pointless extra clicks. I’d love to see the game streamlined, but it’s never slow enough to be a serious problem. I’m glad there aren’t any serious issues, because it’s not like many fans of async word games are going to pass this one up. If you’re not completely sold, grab the ad-supported free version. You’ll probably get hooked-Hanging With Friends is fun, cute and clever, so you’re going to find lots to like. And if you need a few more friends to play with, our forum thread is a great place to start.